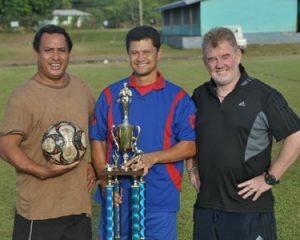 Samoa Football > News > SamoaTel National League > Football season officially warps up with prize giving. 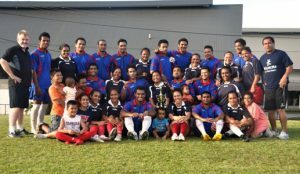 This event was coordinated and hosted by the Football Federation Samoa (FFS). For once when coming to the football fields players and team officials did not have to worry about winning and playing well during a match. On this occasion they were able to sit back and enjoy the festivities. Over the course of the season FFS had organized 3 league competitions for the men which included the Premier League and the First and Second Division. Kiwi went on to win the Premier League, while the First Division went to Vaimoso and the Second Division to Lupe Ole Soaga B team. Moaula United than took out the Cup Competition. In the Women’s Division, Kiwi won the Premier League title while Adidas took home the Cup Competition. The under 15 Boys League was won by Moaula United and the Cup Competition by Moataa. All the teams, which had won either the League or the Cup Competition, were awarded with trophies and prize money during the prize giving. Also included in this were several teams who had finished in second, third or fourth place in their respective competitions. Several individual players were also awarded with prize money and trophies for stand out performances during the season. These awards included the Player Of The Year, Golden Boot for the player who scored the most goals and Golden Glove, which was awarded to the best goalkeeper. Fereti Gosche from Moaula United and Lionel Taylor from Kiwi shared the Men’s player of the year awarded. Vaalii Faalogo from Lupe Ole Soaga was awarded for the best player in the Men’s First Division and Christopher Peni from Vaimoso B team in the Second division. Suitupe Tafafa from Kiwi got the player of the year in the Women’s and Pago Tunupopo from Moaula United was awarded the best player prize in the Boys Under 15. The last award of the day given out was the Fair Play awards which was given to a club with the best disciplinary and attendance record during the competition. Adidas and Leauvaa ended up sharing this award. 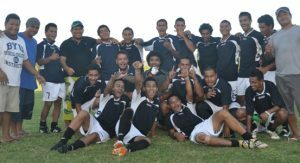 The SamoaTel National League had kicked off in September 2010 came to a close the previous week with the finals of the SamoaTel 2011 Cup Competition. Previous Post Samoa wins 9-0 against American Samoa. Next PostBusiness House Football is back. Business House Football is back.